Border Security Force 1763 vacancies. 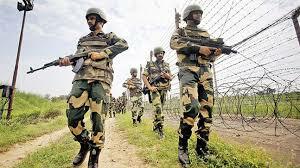 BSF Has Invited Online Application Form for Constable Posts in Border Security in Directorate General, BSF. Interested Candidates Can Read the Full Notification Before before they Apply Online form. (iii) 2 years of Diploma from Industrial Training Institute in the trade or fiel or similar trade. Relaxation as per rules applicable. The selection will depend on the basis of Physical test and Interview only. Candidates should send their application Form in prescribed format to concerned Recruitment Agency or Authority (BSF HQRs) under which their State falls. Along with that recent passport size photographs attached, examination fees should also be paid. Other required documents within 30 days from the date of publication of this advertisement in Employment News Paper and 45 days for those candidates belonging to far flung areas as mentioned states North Eastern States, Sikkim, Ladakh Division of Jammu & Kashmir State, Lahaul and Spiti Districts and also Pangi Sub-Division of Chamba District from Himachal Pradesh State. We hope now you are aware about Border Security Force Vacancy.